Mmmmm. Coffeeeee. The smell and taste of coffee alone gets me up, caffeine gets you going so why not where it right on your chest and show it off. 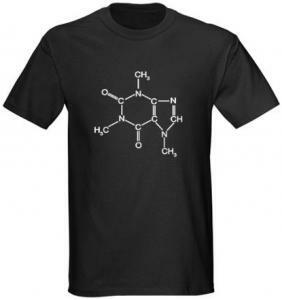 This is a t-shirt that features the molecule for caffeine on the front, all of the elements that make up this awesome drink can be found all connected and looking as good as a cup of coffee. This t-shirt is made of 100% cotton and is available in many sizes, colors and check out the many different styles that are available to choose from. Many of us start with a cup of coffee. And that is the story this t-shirt tells us it says “Caffeine Powers Activate!” and has a picture of a a very active coffee cup. This is a great shirt for you if this is how it works for you or the perfect gift for your coffee addicted friends. This fun caffeine t-shirt comes in different colors and sizes and unfortunately does not smell like coffee. 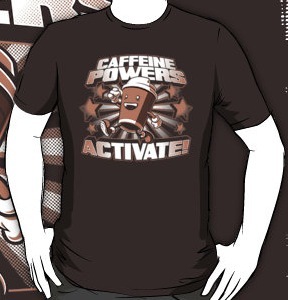 Now is the time to refresh you self with this Caffeine Powers Activate T-Shirt.